Though winter doesn't start for five days, many of us have already seen enough snow. One person who gets to deal with more than his fair share of snow is Roads & Grounds Department Manager, Mike Becker. He points out that the hazards of snow shoveling go beyond back strains and slips; moving heavy snow is also hard physical labor. Here are some tips for avoiding injury during snow removal. Fitness - The frequency and severity of heart attacks peak in winter. 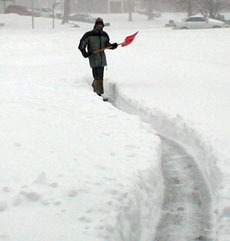 If you are over 45 and sedentary, avoid shoveling unless you get approval from your physician. If you smoke, have heart disease, high blood pressure, are overweight, or on chemotherapy, you should avoid shoveling regardless of age. 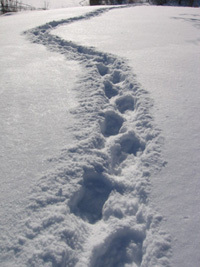 Many safety problems that occur during the winter months are due to ice or snow-covered surfaces. Mike Becker, head of FESS's Roads and Grounds Department, notes that refreezing is an ongoing problem at Fermilab. Stay alert: Ice and snow that melt during the day can refreeze at night. If you are aware of an area where water is accumulating on walking or driving surfaces, please contact Roads and Grounds at x3303. Becker also reminds you to be patient, especially when the temperature falls below the freezing point. Even the laboratory's lowest temperature de-icers stop working below 10 degrees F.
If you arrive before normal business hours be aware that snow and ice removal may still be in progress. If possible, park in a plowed lot. When opening a car door after parking, check the ground before taking your first step. There may be a thin layer of hard-to-see ice. This is the time of year when there is more darkness than light. In fact, a lot of us drive to and from work in the dark. If it seems that this would make it easier to run into things, you're correct. 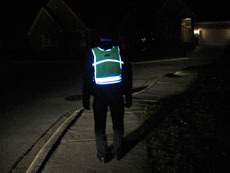 The fatality rate for pedestrians is three times higher at night than during the day. Even small differences in light associated with phases of the moon can change the fatality rate by 22 percent (UMTRI). So what can we do to help prevent vehicle-pedestrian collisions when it's dark outside? 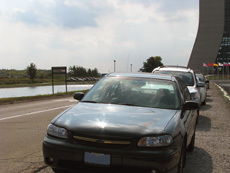 During the past five years, Fermilab's Security Department has investigated 249 vehicle accidents. Most were relatively minor, producing limited property damage. However, eight resulted in personnel injuries. Among these injury accidents were three tree collisions and two rollovers. Not unexpectedly, the more severe incidents were associated with vehicles moving forward at high speeds that probably exceeded posted speed limits at Fermilab. Always maintain an awareness of your speed and lookout for changing road conditions. This special time of year carries with it some special hazards. As you plan your activities, keep a few precautions in mind so your memories can be good ones. Vehicles - Avoid impairment and distractions. If you consume alcohol, wait an hour for each drink you've had before you drive. Better yet, designate a non-drinking driver. If the celebration will go on past your bed time, consider leaving early or sleeping over. If you are driving home, make sure you've got a good idea of where you're going to minimize fumbling with directions. Also, remember to watch out for other drivers. The wheel has long been known as one of man's greatest inventions. As good as it is, however, even the simplest machine can fail, causing people to get hurt. During the past six weeks, Fermilab has had four occupational injuries caused by wheels getting stuck during the manual movement of equipment. Two occurred upon elevator entry, one in the low spot at the hinged area of an open tailgate, and one was due to a wayward-facing caster. In every case, an unexpected stop either caused or contributed to the injury. With the return of cooler weather, doors and windows will be closing, outside ventilation intakes will be dialed down and heating systems turned up. There will be less fresh air and we need to be concerned about indoor air quality. Aside from industrial processes, combustion is one of the major sources of indoor air-quality problems. Fossil fuels used for heating, cooking and in internal combustion engines can release harmful contaminants such as carbon monoxide, nitrogen oxides and particulates. Furnace leaks can result in carbon monoxide poisoning, the State of Illinois requires placement of monitors adjacent to sleeping areas. In cold weather, vehicle operators may be inclined to leave their engines running near or even inside building loading areas. This is a practice to be avoided. Got a tough ES&H problem? Most ES&H issues can be readily resolved within your work group. Involving your supervisor or division or section ES&H personnel is also a good idea since these folks are usually aware of your exposures and know how to deal with them. But what about those few problems that do not yield to the standard approach? One option is to use a reporting tool on the ES&H Section Web page. First click on the Quick Link called Report ES&H Concern, then select Safety Concern or Suggestion Box. Safety Concerns are managed by the CD Help Desk. You must provide your identity, but this allows you to be kept informed of progress addressing your concern. The Suggestion Box is managed by the ES&H Section, and issues can be anonymously submitted -- an option that could prove useful if you fear reprisal or embarrassment. Although spring seems to be the mating season of choice for most animals, deer prefer to mate in fall, between October and mid-December. 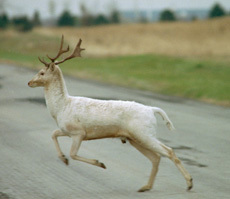 The associated courting behaviors significantly increase the risk of deer-vehicle collisions. We have recently averaged four such accidents per year on the Fermilab site. Most occurred around dusk and were minor in nature, but this is not always the case. Last December, a Fermilab security guard was surprised when a deer ran into the driver's side of her vehicle at 10:30 p.m. The officer's knee was injured in the collision resulting in two lost work days. The vehicle was dented from the front fender to the driver's door, and the outside mirror and door frame were wrecked. The deer ran off and was not found. The officer remarked that the animal suddenly came out from the side of the road. Fermilab's most costly work injuries generally result from aggravating pre-existing health conditions. Although an employee's actions can cause the injury, many injuries can stem from pre-existing conditions, including genetic predisposition, prior injuries, lack of fitness and advancing age. While these pre-existing conditions can make it difficult to avoid injury, there are actions you can take to help yourself stay injury free. The laboratory has an active occupational medicine program to help assure that workers are capable of performing required duties without undue risk of injury to themselves or others. Medical fitness is assessed when employees are hired, return to work from injury or illness, change their work activities or are exposed to specific hazards. Glare from the sun is one of the most overlooked dangers of daytime driving. According to the National Highway Traffic Safety Administration, thousands of people are injured each year due to this hazard, some fatally. Driving dangers gain intensity on the days shortly before and after the official start of spring on March 20 and the start of autumn on Sept. 21. At those times, the sun rises and sets at an angle most likely to blind motorists. This presents a danger for Fermilab commuters who enter and exit the property from the east and west. If you commute in an easterly direction in the morning or a westerly direction in the evening, you face solar glare. Are you debating whether to get a flu shot this year? Not everyone will contract influenza during the upcoming cold and flu season, but why take a chance? 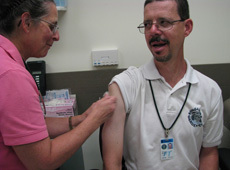 Fermilab's onsite Occupational Medical Director Dr. Brian Svazas said the shot is 70 to 90 percent effective in preventing infection, and even if you do catch the flu, the symptoms will be lessened. Maybe you got sick the last time you had the shot and worry that will happen again. According to Svazas, sickness after the flu shot usually means you suffered from another infection, not influenza. According to Mike Bonkalski, FESS senior security officer, much of hand safety boils down to maintaining an awareness of your surroundings. 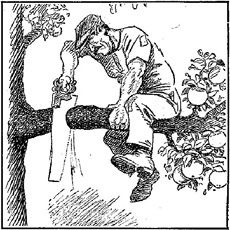 Workers should watch where they put their hands, especially when trying to find a place to grab an object to move it. When multiple people are involved in a single manual lift, hand injuries can occur if unsynchronized actions result in a load shift. Martha Heflin, PPD senior security officer, adds that workers need to think about where their hands will go if the tool they are using suddenly slips. One example of this is the "knuckle buster," a type of injury that mechanics can experience when they push a wrench toward an unforgiving surface. The number of occupational hand injuries occurring at Fermilab has steadily risen over the past year. 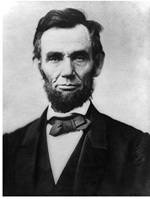 There were six in the fourth quarter of 2006, seven in the first quarter of 2007 and 14 in the third quarter of 2007. We have had 14 hand injuries in the fourth quarter of 2007 and we still have two weeks to go. Several Fermilab safety personnel were consulted in preparation for this article. All agreed that worker failure to think about the potential consequences of their actions has been a major factor in these kinds of injuries. In addition, they offered the following advice. 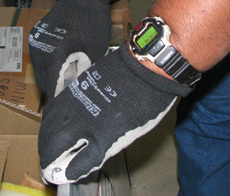 TD Senior Safety Officer Rich Ruthe noted that specialized gloves are sometimes needed to obtain adequate protection while not adversely impacting the process. To protect your vision at work, you may want to make sure you have up-to-date, well-fitting prescripton safety eyewear. Fran Gilkerson can help. As the onsite representative for Aero Technologies, Fermilab's prescription safety eyewear vendor, Gilkerson places orders, dispenses, and fits delivered eyewear, and takes care of repairs. You can find her on Wednesdays from 9 a.m. to 2 p.m. next to the East Wilson Hall elevators on the mezzanine level. Procedures for obtaining prescription safety eyewear, including a copy of the request form, and an online appointment scheduler can be found here. Be sure to have an eyewear prescription that is less than a year old before scheduling your appointment. You can view available frame styles at AOSafety's Occupational Prescription Eyewear Web site. Do you need safety supplies? Maybe you can find what you want in Fermilab's stockroom. To find out what they have to offer, we visited the stockroom located in the east end of Warehouse 1 at Site 38. As we entered the area, we were greeted by store keeper Dan Ewen who was working behind the walk-up counter. Ewen explained that the stockroom carries personal protective equipment including earplugs, gloves, non-prescription safety glasses, hard hats and Tyvek clothing. They also stock sun block, hand sanitizer, mosquito repellant and hornet spray. 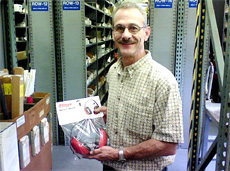 Ewen said that the highest volume items they carry are gloves and glasses. Leather gloves are most requested by FESS employees, while technicians prefer nitrile and cloth gloves. When most people begin a new activity, they tend to hope that things will go right. After all, it is human nature to be optimistic. While a great approach to life, this trait can get in the way of looking at a situation with a critical and objective eye. Although we try to develop a straightforward set of tasks to accomplish a project, if we don't think about what could go wrong, we are more likely to experience accidents, delays, increased costs, and decreased quality. Lab policy requires a pre-work review for all activities carried out by Fermilab employees (FESHM 2060) or service subcontractors (FESHM 7010, 7011, and 7020). 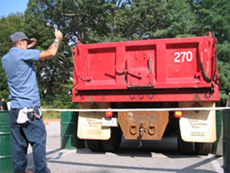 The purpose is to identify the ES&H hazards and specify the controls needed to minimize the likelihood of an accident. In some cases, a written hazard analysis may be required such as when the jobs are complex, hazards are great or unfamiliar, or the actions of multiple organizations must be coordinated. Stress is a disruption of normal body processes due to psychological or physical factors. The resulting fight or flight reaction produces a state of heightened awareness and abilities that can serve us well albeit infrequently in our "civilized" world. However, pressures that are too intense or too long-lasting can cause an overload. In addition to direct health consequences, the risk of accidents is increased due to the following behaviors displayed by a stressed person. Studies have shown that eye problems occur in 75 to 90 percent of computer users. When you look into the distance your eyes are relatively relaxed. When you focus on something nearby, your eye muscles get a work out. Although this isn't necessarily a problem, an extended period of close-range focusing can cause eye strain, neck pain, blurry vision, headaches and difficulty changing focus, all elements that may occur with Computer Vision Syndrome. This may also cause dry eyes, since eyes are open wider during computer work and blinking is reduced. Toolbox meetings are brief, frequently-held safety get-togethers intended to inform and motivate employees about ES&H matters. Sometimes these meetings are also known as tailgate meetings or coffee break meetings, and they are a great way for every department to focus on ES&H on a regular schedule. The Operations Department in FESS is a good model of how these meetings can be unobtrusive. Their weekly toolbox meetings are scheduled for the same time each week: Friday at 12:30 p.m. 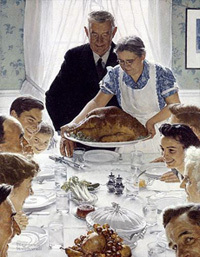 This continuity has simplified scheduling and encouraged attendance. Since this is the only time during the week that the group's entire day-shift meets together, the meeting is also used for general announcements including site status and operational information. We recently spoke with Tom Dobrinska to obtain additional information about wasps. Dobrinska is an entomologist who provides training for Anderson Pest Solutions - the company that provides Fermilab's pest control services. Dobrinska explained that when it comes to stinging, yellow jackets are the main culprit. From May to July yellow jackets look for protein to use in egg production, but beginning in July they switch to carbohydrates. During either time, a good preventive measure is to cover food and waste. Although experts recommend letting the wasps go about their business, it is sometimes necessary to kill them. 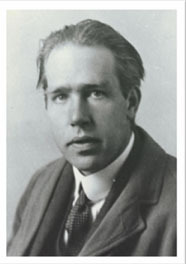 When an area needs to be cleared of wasps, Dobrinska suggested using bottle traps as an effective method. Traps should be set up one or two days ahead of time and placed a comfortable distance from the location of planned activity. Two or three traps should be enough for a typical backyard situation. Work processes for some Fermilab employees are fairly predictable. Their routine allows them to carefully analyze and subsequently implement measures to assure that their tasks have been completed efficiently and safely. Unfortunately, much of our work has a non-routine nature and success rests heavily on the worker's problem solving skills. We recently had a few incidents at Fermilab where workers failed to realize what they didn't know, and wound up getting hurt. At Fermilab, there are two basic approaches to deal with a task: ask an expert or handle it yourself. The former is generally preferred since it is more efficient, requires less effort and has a greater probability of getting the job done right. You should start by asking your expert to explain the correct way to do the task. Make sure they include potential problems and how to handle them. This information was missed in the recent incidents. If possible, ask the expert to demonstrate the technique while you watch, then have the expert watch while you perform the task. 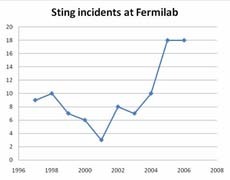 From 1997 through 2001, the number of wasp and bee stings reported to Fermilab's Medical Department steadily decreased. This trend reversed itself in 2002. The reasons for these fluctuations are unclear, but an increase in the number of wasp stings indicates that this is a problem that deserves renewed attention. Medical Department data show that July has traditionally signaled an abrupt start to the stinging season. Wasp sting incidents continue throughout the summer and then steadily decline through September and October. In 80 percent of the attacks, a person's hands, arms, head or neck were targeted. Recently, while performing maintenance in tall grass, a Fermilab employee felt what he thought was a mosquito bite his ankle. After work, he noticed the bite had grown to a 2 cm red lump with a central dark spot that produced much itching and irritation. The next morning, the employee reported to Fermilab's Medical Department. They found a 5 cm lump with a central ulcer surrounded by 20 cm of pink skin. Antibiotics were given to treat the growing infection. During the week of June 18, 2007 three unrelated power drill injuries occurred at Fermilab, an unusual number of cases for a single activity. 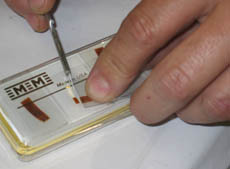 Although wasp stings and tick bites are commonly seen by the Medical Department, it is possible that the employee suffered a spider bite. Whenever insects penetrate skin, the concerns are allergic responses and infections from skin-borne bacteria. Below are some tips for minimizing undesirable insect encounters. On 06/11/2007, a Fermilab graduate student accidentally sliced into the side of his left thumb pad with an X-ACTO blade while trimming a strain gauge. The wound was sufficiently serious that he was sent offsite for care that included 12 sutures. The task was an unusual one for the student, and, it turned out, he had not been following the procedure on which he had been trained. The immediate causes of most hand injuries include using the wrong tool for the job,not wearing the appropriate kind of hand protection and not following procedures, as well as periods of inattention. Here are some things to remember to help prevent injuries to your hands. When Chicagoland's air quality is expected to reach unhealthy levels, Fermilab takes steps to mitigate the problem. 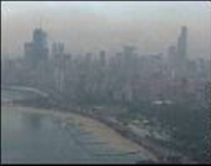 Participation begins with notification of the Directorate, Division/Section Heads, and the Office of Communication that an Air Pollution Action Day has been declared. This information is communicated to onsite personnel in many forms, including notices in buildings and in Fermilab Today. When you receive this information, we ask that you do your part to limit ozone and particulate pollution. Below are some suggested actions. Fermilab is a great place to ride a bicycle. We have interesting scenery, a paved bike path stretching across the site, and plenty of lightly-traveled roadways. 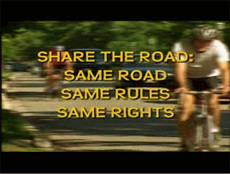 However, when motorists and bicyclists meet, rules of the road and common courtesy can sometimes be overlooked, leading to conflict. It is important to remember that conflict can occur when on the road and that getting angry, hostile or abusive won't help the situation. We need to stay calm, exercise caution and show respect for each other, no matter how we're traveling. Fermilab accidents are much like those that occur in other workplaces. Similarly, prevention boils down to dealing with a relatively small number of issues. Here are five questions to keep in mind as you go about your daily activities. Can I stay focused? Lack of attentiveness is a factor common to most accidents. What are the consequences of inattention? Are you tired, ill, or taking medications that affect alertness? Is the mental workload too low (boring) or too high (stressful)? Are you responsible for managing the activities of others? Stay in touch and motivate your employees by simply walking around, observing them and their environment and talking to them. If you do this on a regular basis, you can quickly identify where they are succeeding, having difficulty, and how you can help them. This technique often results in an improved level of trust. Employees feel their manager knows what they're doing and the manager is better equipped to deal with their issues, whether good or bad. MBWA can be a useful technique with ES&H. When you visit a work station, look for changes in the environment. Are processes or equipment modified? When you talk with employees, ask about their work activities. 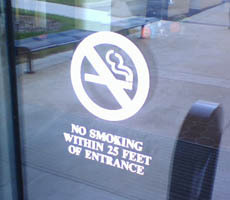 Do they have any suggestions for improvement or safety concerns? On March 30, 2007, a truck arrived at CERN Temporary Storage Building 609 to deliver material for the ATLAS detector. A CERN employee assumed the role of spotter and began guiding the truck into the building. While walking backwards, the spotter fell over a pallet and broke his hip. Subsequent investigation by CERN's Safety Commission determined that access to Building 609 was, indeed, partially obstructed. 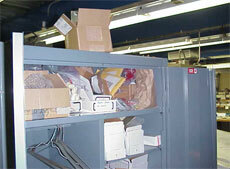 Poor housekeeping can contribute to accidents by hiding hazards that already exist, as well as by creating new ones. Proper controls include maintaining neat work areas, keeping halls and floors free of slip and trip hazards, and removing fire hazards and waste materials. Housekeeping should be an ongoing activity, since periodic cleanups are usually ineffective in preventing accidents. 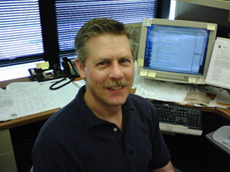 In a recent conference call with DOE field managers, the Chief Operating Officer for the Office of Science, George Malosh, remarked that electrical work continues to be a primary hazard. Looking at the causes of these accidents will help us to prevent the mistakes involved. 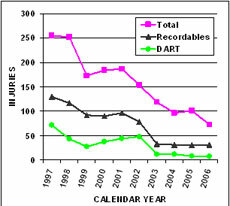 In the past 16 months, Office of Science facilities have submitted 251 reports to DOE's Occurrence Reporting and Processing System (ORPS). 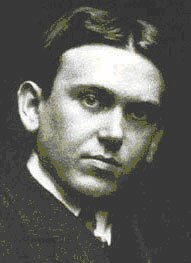 Of these, 41 were associated with electrical hazards. About two-thirds involved 120 VAC circuits while the remainder fell in the 208-480 VAC range. Medical procedures involving radioactive isotopes are more common these days. If a Fermilab employee receives this type of treatment, some precautions might be necessary when the person returns to work. In nuclear medicine, radioactive isotopes are administered to a patient via injection, inhalation or swallowing. Based on its chemical properties, the material accumulates in specific body parts. 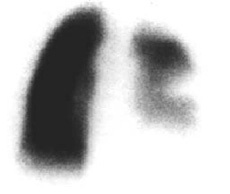 For example, Technetium-99 is used in 80 percent of diagnostic procedures for a variety of organs. Thallium-201 is the isotope of choice to assess coronary artery disease. Idoine-131 allows for the treatment of thyroid cancer and other diseases. The H5N1 virus has spread through bird populations in 50 Asian, European and African nations. In addition, of the 291 people who have contracted the disease, 59 percent have died. If the H5N1 virus mutates to become easily transmissible between people, a flu pandemic will likely result. This would disrupt the normal day-to-day activities and services that we take for granted. Knowing what to expect, how to prepare and where to find information can help minimize the impact of a pandemic on you and your family, should such an event occur. This information can be found at DOE's Office of Health, Safety and Security website, as well as the US government's pandemic flu website. Adult Canada geese can be very aggressive in defending their nests and goslings. This behavior lasts from the time eggs are laid until the time the offspring take on adult coloring. Typically, you first get a hissing sound as a warning. If not dissuaded, the birds may charge or even fly at you. 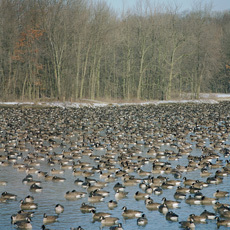 Employees and visitors are regularly threatened and chased by geese, and a small number are struck by the birds. When injuries occur, they are usually minor and due to a fall from trying to elude the goose. Close encounters typically occur around Wilson Hall and the Industrial Buildings. Here are some suggestions for dealing with aggressive Canada geese. Earlier this month, one of Fermilab's hazardous waste technicians received a minor cut from a disposable knife blade that had poked through a plastic bag of regulated waste. The blade should have been wrapped several times in heavy adhesive tape or placed into a polyethylene bottle with a cover. Bridget Iverson joined Fermilab's Technical Division as environmental coordinator last October, after extensive work in the world of consulting. Bridget, who has a B.S. degree in environmental health, first worked in Las Vegas on environmental characterization of the Nevada Test Site. She later returned to Chicago where she worked on an ES&H compliance e-mail reminder system. 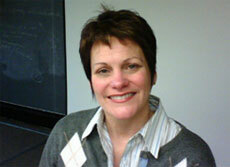 Judi Andersen is a physical therapist with Back Works Joint & Spine Rehabilitation Specialists. 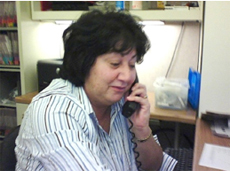 Over the ten years that she has been under contract to Fermilab, Judi has probably trained every employee on back care. Her triennial Back Works refresher on March 1 contained a wealth of practical advice. Here are some of the key points from the experience. 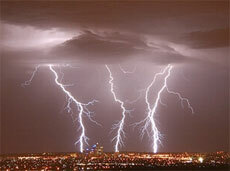 The State of Illinois has designated March 4 through March 10 as Severe Weather Awareness Week. The goal is to help prepare for hazardous weather during warmer months, including tornadoes, thunderstorms, lightning, flooding, high winds and large hail. 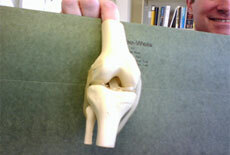 The knee is the largest joint in the body and is often the site of pain and injury. Though it accounts for only 3.7 percent of Fermilab's recordable occupational injuries since 1984, it is responsible for a disproportionate amount of disability: 8.2 percent of lost work and 8.9 percent of restricted duty days. A Fermilab employee recently cut a finger reaching into the top of this cabinet to retrieve a part. Four sutures were required to close the resulting flap laceration. The sharp metal edge has since been filed smooth. On Wednesday, January 17, two Fermilab employees suffered recordable finger injuries in unrelated accidents. 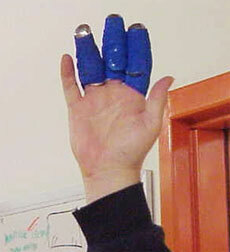 One worker inadvertently touched his left index finger to a sanding wheel. A recent study by the National Highway Traffic Safety Administration and the Virginia Tech Transportation Institute concluded that driver distraction is the leading cause of traffic accidents.